NOS's new CrossHair™ plate systems have been designed with the serious racer in mind and are capable of 350+ HP. Based off of the ever popular Double Cross plate systems, the CrossHair™ takes this time tested design and improved it for better distribution of the fuel and nitrous. This is especially important with the complex intake manifold designs out today. The CrossHair™ plate systems feature double down nitrous bars for improved distribution and atomization, along with new track tested tune up's. The New CrossHair™ nitrous plates will give you the power you need, when you need it. 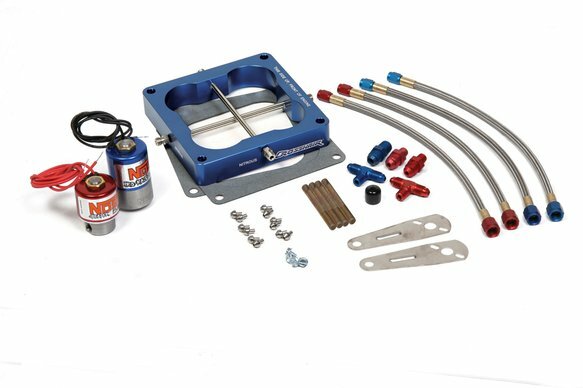 CrossHair™ kits come with a blue anodized CrossHair™ plate in either Holley 4150™ or 4500™ (Dominator®) bolt patterns, new improved solenoids, jetting, plumbing and hardware. Available separately, NOS offers electrical wiring kits and bottle kits in a variety of combinations so you can make up your own custom kit combination.